Mr Guaidó declared himself interim leader in January and says he is supported by "almost 90%" of Venezuelans. He also has US backing. Offices would stop working at 14:00 local time "to achieve consistency in the provision of electricity", Communications Minister Jorge Rodríguez said on state TV. 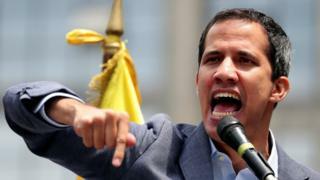 Mr Guaidó told the BBC's Leonardo Rocha that the frequent power cuts and water shortages - which have hit hospitals, public transport and other services - were driving intense public anger against Mr Maduro's government. "We have a situation now with protests in more than 20 districts of the capital, Caracas, and in all Venezuelan states. People are demanding that power and water supplies be restored, but also for the usurper, Nicolás Maduro, to go, which is the main message," he said. However, Mr Guaidó said Mr Maduro could not be removed unless Venezuela's military switched allegiance. "The support and the backing of the armed forces will be necessary in order to achieve democratic and peaceful change in Venezuela in all areas, including to protect protesters from the pro-government armed militias," he said. 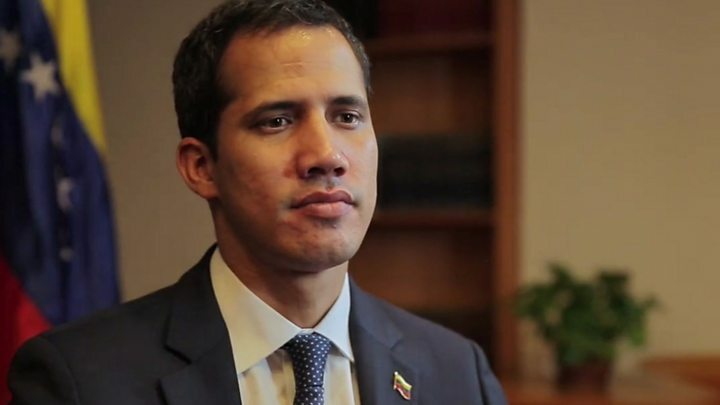 Mr Guaidó - who the government says will be barred from holding further public office for 15 years - dismissed the recent reported arrival of Russian troops in Venezuela as a "provocation" by Mr Maduro to "try to show some sort of support that he really doesn't have". "The Russians haven't made any concrete moves. They haven't shown any real support apart from, perhaps, some diplomatic statements," he said.